We met Elin Kristoffersson in Härnösand while she was checking out the premises for an upcoming solo gig. Elin is a dancer and choreographer from Älandsbro, Mid-Sweden. Since 2009 she has been running her own production company called Korona Dans. Throughout this fall she will be collaborating with a private theatre group called Teater Soja and their play Sundsvallsbor 3.0. The play narrates the story of Sundsvall and its people. In this new performance the company has included dance to deal with changeovers on stage – that is where Elin’s work comes in. For her, working with stage actors is quite a novelty, but she is really enjoying this project. “I am curious about theatre and now I have better understanding about acting” – Elin tells us – “I will be involved in a bigger project with Teater Soja further on; we are working on a children’s performance together”. Elin first met Teater Soja during a meeting with the County Council – they brought representatives from different creative sectors to get feedback on to their cultural plan. Then it took almost a year for Elin and Teater Soja to start their cooperation. “I sent them a script and asked if they wanted to cooperate with me – that’s how the idea for a children’s show came about and that’s how we started to work on Sundsvallsbor 3.0”. Elin Kristoffersson graduated from Balettakademien in Gothenburg 2003. She studied Contemporary Dance (Graham and Release techniques), classical ballet and jazz. She moved to Stockholm and continued to take dance classes. She had a few dance jobs but she earned her living by working in a shop. “In school we were told not to work for free – but that locked me up a bit. I was thinking more about how I could make money through dance, instead of how to create good artwork. Now I am of the idea that you should simply start to work. Do your own projects and find your own creative voice. You need to find the heart in what you do and ask yourself why you want to do this. It can take years to find it out”. Elin stayed in Stockholm for nine years before she decided to move back home to Mid-Sweden in 2012. At that time, she had a concrete idea to apply for money from public funds. During her first year in Mid-Sweden, she worked in a café but since 2013, she has only been focusing on dance jobs. She does some projects with kids in schools but it is all related to dance. 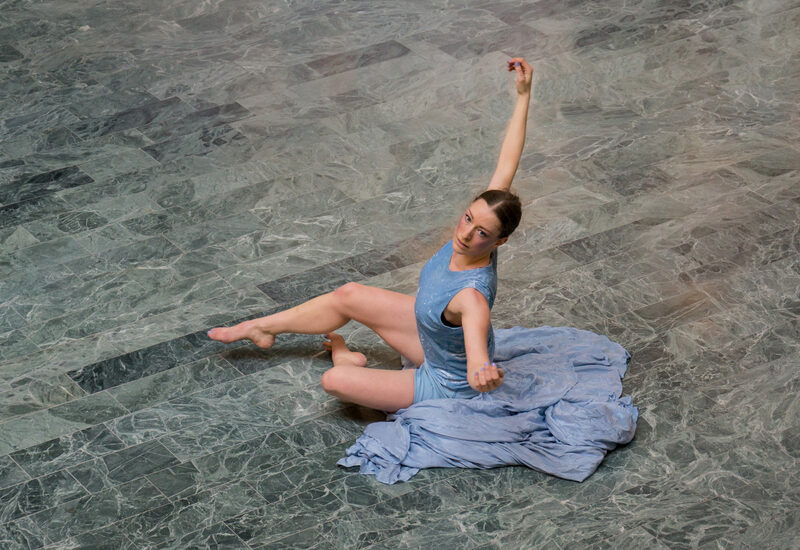 “It can be hard work to get audience and to convince organisers that dance is something to invest in” – Elin says – “Dance is an art with tight margins. There’s a lot of work behind a small piece of dance, and working with kids within the education system sometimes saves you”. Recently Elin has also been a part of a project that uses dance to increase integration and get immigrants to participate in activities for better health and fellowship. Her plans for the future is to reach businesses and conferences and try to work with dance in bigger events and meetings. Elin is also planning to create some work that involves ice, snow and light. Elin does a lot of outdoor performances and she finds inspiration in nature, different materials and people. She is also inspired by performance-dance and a Japanese type of dance called butoh. When we asked her to tell us about her dream job, she told us that the cooperation with Teater Soja is her dream job, at this particular time: she is very happy and proud of the cooperation. “The actors were a little reluctant at the beginning, but I feel I introduced them to another dimension of what dance can be and how they can use it”.